BOHEMIA, NY--(Marketwired - Feb 16, 2016) - AmpliTech Group, Inc. (OTCQB: AMPG) announced today that they have completed the move to their new facility at 620 Johnson Avenue in Bohemia, NY. CEO Fawad Maqbool stated, "The new facility is located in the heart of the Industrial Center in Bohemia, NY. 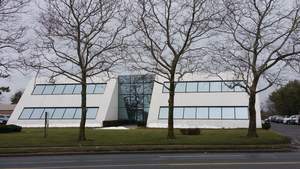 It is located minutes from the Islip MacArthur Airport, a main business hub for Long Island and Southwest Airlines. This new location and double the space from our previous location will allow us to increase our productivity and exposure to the larger OEM customers that we will now be targeting for expanding our business. This strategic move is part of our plan to grow our sales, revenue, and profitability as we have been doing throughout the last 15 months. In the coming months we will finalize the development of our revolutionary CoolAmp™ Series of Low Noise Amplifiers (LNA) for wireless and satellite markets and introduce a new line of SSPA (Small Signal Power Amplifiers) and HPA and MPA (High Power and Medium Power Amplifiers) for the same markets. These products will greatly improve the mobile and wireless network signals and push us into the next generation of wireless productivity. The expanded product lines will launch us into these lucrative and rapidly growing large volume markets. We received some large orders last quarter and we plan to continue to book large orders for the coming months and expect to increase our revenue considerably for the rest of the year. Our first quarter will exhibit some inertia due to the move and logistic issues, but by the second quarter, we will be well on our way." About this company AmpliTech Group, Inc.